A cuddly toy of your orangutan. An orangutan factbook together with bookmarks and stickers too. Two exclusive magazines: WWF’s ‘Wild World’ and ‘My Orangutan with news and updates for your adopted animal. Orangutans are very athletic and fantastic climbers and love to spend their time up in the trees where they can watch over the comings and goings of the hot rainforest. Unlike other apes, they are happy to spend time alone, and only ever come into contact with others during mating season. Completely vegetarian, these amazing creatures make nests in trees as they very rarely venture onto the rainforest floor. Orangutan numbers have fallen by up to 50% across the globe in the last decade. Your kind donation will help WWF to extend protected areas of rainforest and work with local communities to help them manage their area through the sustainable use of natural resources. Orangutans only live on two islands in the whole world – Borneo and Sumatra. They can live up to 45 years of age and can weigh as much as 120kg! 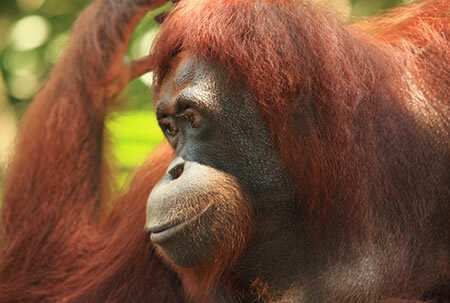 The word orangutan means ‘Person of the Forest’ in Malay, the native tongue of Indonesia. Humans share an amazing 96.4% of our genetic make up with orangutans. Orangutans make umbrellas out of leaves when it rains and use sticks to get honey out of bee’s nests to stop them getting stung. I may be famous for monkeying around in trees, but in the last 10 years nearly half of my fellow orangutan friends have disappeared from the planet. People keep cutting down the areas where I live slowly leaving me with nowhere to call home. Please adopt me today and help WWF to protect my precious rainforests and teach our human neighbours that we depend on the trees to survive. Although it’s our home, we can still share it together. 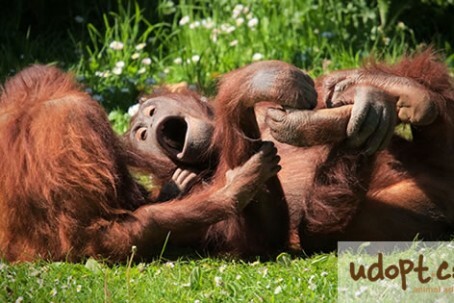 Easily identified by its large size and red hair, the orangutan is the only great ape that lives outside of Africa. Sumatra and Borneo orangutans are the only remaining groups and live in the Indonesian archipelago. Unlike their African cousins, orangutans spend almost all of their time living in the tree tops. They are too large to be able to move easily through the dense vegetation of the forest floor. In the forest canopy, orangutans are able to swing from branch to branch and cover great distances while searching for food. Orangutans forage for food throughout the day. They eat durian, figs, lychees, mangos and insects but will also eat meat and honey on occasion. These apes live solitary lives but are not generally protective of their territory. Orangutans do not mind sharing trees that have an abundance of fruit and may even call out to each other when they find a large food supply. It is common for orangutans to communicate by calling out to each other through the trees. Their voices are amplified by a throat pouch. The males will make loud calls to establish dominance and intimidate other males. They will also use their calls to attract females for mating. Calls can be heard from over a mile away. Orangutans take their name from a Malay term meaning “person of the forest”, and they show remarkable similarity to early humans. They have very dexterous hands with opposable thumbs that they use to manipulate tools. 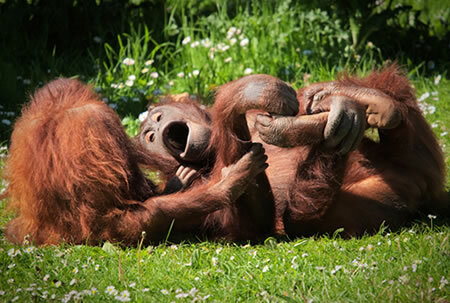 During the day, orangutans can be seen using sticks to get insects out of holes or collect honey. They will use large leaves for rain protection and even hold tough leaves over their hands like gloves as they climb through thorny branches. Orangutans are extremely intelligent and are able to keep track of where various fruit trees are located and when each tree will have more fruit ready. They plan and organize their foraging to make sure that they get fruit as soon as it is ripe. Females give birth to a single baby after nine months of pregnancy. The young are nursed until they are three years old and the mother continues caring for her baby until it is eight years old. The mothers spend their days teaching their children how to find food and how to use sticks and leaves as tools. At the end of the day, orangutans make nests in the treetops. Their beds are crafted by winding branches around each other and then padding the branches with a mattress made from leaves. I am one of the most intelligent animals on earth and I would like to tell you a little bit about me! I come from a group of Borneo orangutans and we have a lot in common with humans. Let’s start by talking about my mother. Like you humans, my mother was pregnant for nine months before she gave birth to me. My mum is the best and all my aunts are good mothers too. They spent a lot of time teaching me and my brothers how to take care of ourselves, and that’s why we are really close to our parents, all the way up to eight years old. I like to plan things. Not many animals can do that. I can remember that the mango tree by the river will have fruit that’s ripe in three days and I can make sure that I get there in time. I can also come up with plans to solve problems. Like, if I know there is honey in a tree. I don’t want to stick my finger in and get stung so I use a stick to pull the honey out. I can make things too. When it rains, I make rainwear out of big broad leaves so that I can be more comfortable. At night, I make a bed by weaving together tree branches and cushioning them with a thick layer of leaves. We usually live by ourselves but we talk to each other a lot. We can make our voices really loud so that other orangutans can hear us from up to a mile away. We boys call each other to brag about how strong we are, and how it would not be wise to try and take our food! “If we’re so smart, why is the orangutan endangered?” That’s something I wonder about. We are big animals and we need big territories. Otherwise there is not enough food. But people are taking the places that we live and cutting down the trees. Sometimes my orangutan friends are killed when the trees are cut down. After the trees are gone, we don’t have enough to eat. No one wants to see us orangutans endangered, but that’s unfortunately what happens. Orangutan adoption is one way that people can help us. Take a look around this website and you’ll be able to find an orangutan charity that can help to protect us and the places we call home. The world’s orangutan population is in decline and under threat. The threats largely come from human’s interacting negatively with the natural habitat they call home. Forty thousand years ago, humans first moved into the Indonesian islands. The orangutan population has been declining ever since that time. Initially they were hunted for their meat. In the last two hundred years they have been hunted for their babies. The young are captured and sold as exotic pets. Orangutan mothers are very protective and are often killed while defending their babies. The clearing of forests for agriculture and for exotic timbers is also killing orangutans. In recent years, large tracts of orangutan habitat have been destroyed for the palm oil industry. The animals are often killed as the trees are cut down. Those that survive are left with smaller areas to forage for food. Sadly, in areas of deforestation the orangutans are also more susceptible to capture for the exotic pet trade. Orangutans do not begin to reproduce until they are fifteen years old. They have a single baby and then do not reproduce again for eight years. At most, an orangutan may have only three babies in her lifetime. This makes it particularly difficult for orangutan populations to recover. There are only five thousand Sumatran and fifteen thousand Borneo orangutans left. It is estimated that five thousand orangutans are killed each year. Without greater protection, scientists believe that these creatures will be extinct in this decade. 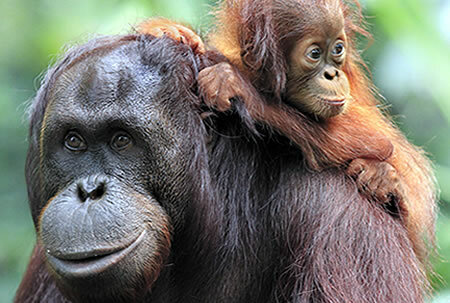 Orangutan charity groups work to establish protected habitats within Sumatra’s national parks. They work with law enforcement to stop the trade in exotic pets. They work to educate the public about the devastation caused by exotic timber trade and the palm oil industry. Orangutan adoption is a symbolic way that people can financially support conservation programs. The orangutan population can be found in Borneo and Sumatra, as shown on the map below.